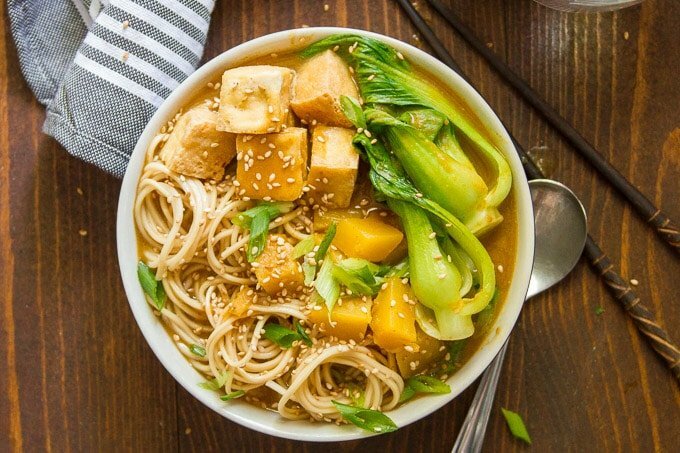 Slurpable noodles, spiced pumpkin broth, and crispy tofu go into making this cozy pumpkin ramen. Packed with Asian flavors and guaranteed to warm you up! I decided that next year I’m growing nothing by winter squash in my backyard vegetable garden. I’ll probably change my mind by the time next spring rolls around, but at the moment I’m all about squash. Are normal people as enthusiastic about winter squash as me? Who knows. One thing I can be pretty sure of: most of you are at least really into pumpkin. My pumpkin recipes get lots of love. And that’s good because my fall squash lineup includes lots of pumpkin. This ramen is pretty darn pumpkiny. I posted a pumpkin chili recipe a few weeks back that included both fresh and canned pumpkin, and I thought the world needed more recipes like that. Also, I had both leftover canned and fresh pumpkin hanging around. Maybe you made that chili and you do too. Make this ramen and use up the rest! This isn’t really your typical pumpkin recipe in terms of flavor. 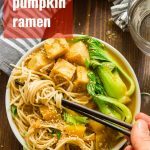 I don’t usually associate Asian flavors with pumpkin, but they work! The soup is seasoned up with some Chinese five spice, which is a blend of cinnamon, anise, fennel, cloves and pepper. So not exactly pumpkin pie spice, but some of the same ingredients, and it’s delicious in savory as well as sweet dishes. To make this ramen, you’ll start by sautéing some aromatics in a bit of oil. Add some broth, canned pumpkin, spices and coconut milk. Then in with chunks of fresh pumpkin. Let everything simmer for a bit. Baby bok choy goes in at the end, so it stays nice and crisp. While the soup simmers, cook your tofu. I fried mine because I was in the mood for something indulgent. But if you want your soup on the lighter side, feel free to bake it, or even fry it with less oil than I used (try this method). Arrange some ramen noodles and tofu in a bowl and ladle the broth over top. 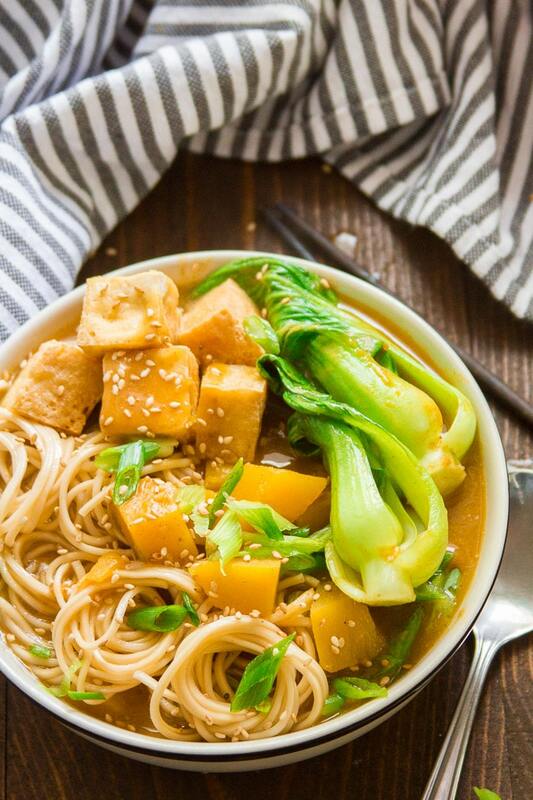 Be sure to get some pumpkin chunks and baby bok choy pieces in there! Top with sesame seeds and scallions, then dig in. Feel free to substitute your favorite variety of winter squash for the fresh pumpkin. 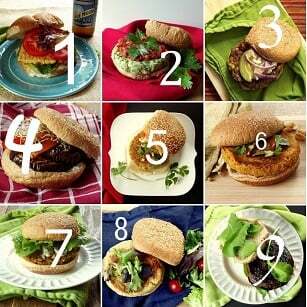 And when winter squash isn’t in season, try summer squash — just reduce the cook time a bit! You can also substitute any kind of noodles you’ve got on hand. Soba noodles, udon noodles, or even spaghetti would work. And finally, feel free to use your favorite veggies in place of the baby bok choy. Broccoli would be a nice choice here. If you have leftovers, store the soup, noodles and tofu separately. The tofu is fried in a lot of oil, and while you all of that oil doesn’t end up in the tofu, I totally understand any hesitancy to when it comes to frying. 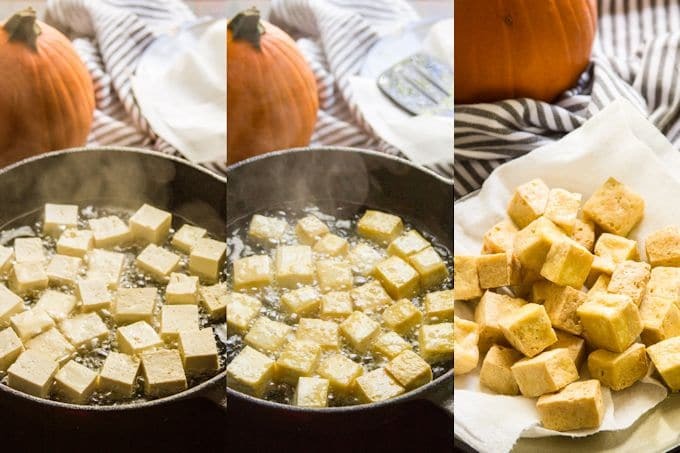 As an alternative, pan-fry the tofu in just a bit of oil according to this method. Bring a medium pot of water to a boil. Add the ramen noodles and cook them according to the package directions. Drain the noodles into a colander and return them to the pot. Toss them with a dash or two of oil to prevent sticking. Coat the bottom of a large pot with oil and place it over medium heat. Add the white parts of the scallions, garlic and ginger. Sauté for about 1 minute, until very fragrant. 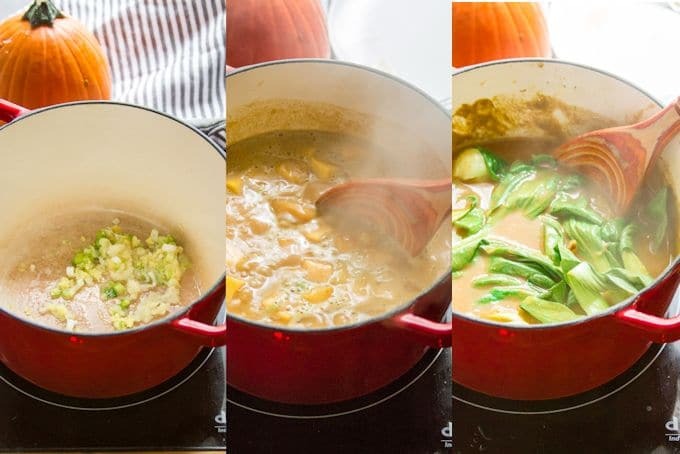 Stir in the broth, coconut milk, canned pumpkin, lime juice, soy sauce, sambal oelek or sriracha, five spice and fresh pumpkin. Raise the heat and bring the mixture to a boil. Lower the heat and allow it to simmer for about 10 minutes, until the pumpkin is tender. Stir in the baby bok choy and simmer for another minute, just until the baby bok choy starts to become tender and turns bright green. Remove the pot from heat and adjust any of the seasonings to your liking. While the soup simmers, place the oil into a medium skillet and set it over medium heat. Give the oil a few minutes to heat up. When it begins to shimmer, add the tofu cubes. Cook the tofu for about 5 minutes on each side, until golden and crisp. Transfer the tofu to a paper towel-lined plate to drain the excess oil. 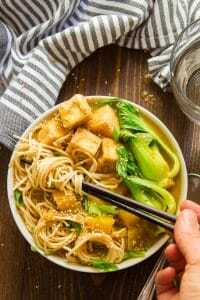 Divide the noodles and tofu among bowls, then ladle the broth over top, adding a few pumpkin chunks and pieces of baby bok choy to each bowl. Top with the green parts of the scallions and sesame seeds. Stir a little hoisin sauce into each bowl. This sounds so good! Love the idea of the 5-spice. I never seem to reach for that as much as I should. What an indulgent soup. We are all about Ramen this Fall. Pumpkin puree is a wonderful way to add flavor and silky texture. Thank you. Thank you for another fantastic recipe, so many flavor notes, very satisfying. It’s like a great big hug! Yay!! That’s such an awesome way to describe it. :) I’m glad you enjoyed this!! This was very good. I had some leftover pumpkin puree in the freezer and the texture was kinda weird after I thawed it but it blended in beautifully. I bought fresh ramen noodles at Whole Foods for my portion and used capellini for my boyfriend’s since he needs low sodium. Both were good. Thanks so much Marry!! I’m glad you enjoyed it!